Based on looks alone, the Kuvasz seems to have a sweet and innocent personality. However, looks can be deceiving. In actuality, this breed of dog is a fearless, strong protector that is determined to protect its family or home. While it has a tough personality, the Kuvasz is extremely gentle and protective of children in its own family. However, this breed has a hard time distinguishing between playfulness and seriousness and can often misinterpret a child’s actions with other children. The Kuvasz tends to be distant when around strangers and may even become aggressive around other strange dogs. While it portrays this type of attitude towards strange humans and dogs, the Kuvasz shows tenderness towards other pets and livestock. This breed of dog is extremely dedicated and loyal towards its family, yet not very affectionate and can be domineering at times. The Kuvasz needs daily exercise, whether in the form of consistent walks or a good run in a safe area. This breed of dog especially enjoys cooler weather and can easily live outdoors in temperate to cold weather. The Kuvasz is most content when it has the freedom to wander between the house indoors and the yard outdoors at its leisure. The Kuvasz has to have its coat combed at least once or twice a week and even more during heaving shedding phases. The Kuvasz has a life span of ten to twelve years. This breed has many health concerns associated with it. Two of the most major health concerns include CHD and OCD. One of the more minor health concerns in this breed of dog is hypothyroidism. Panosteitis and HOD are occasionally seen in the Kuvasz. It is suggested that the Kuvasz has regularly scheduled hip, elbow, and thyroid tests to prevent any health problems. The Kuvasz is considered a Hungarian breed; however it most likely descended from giant dogs of Tibet. It did eventually make its way to Hungary from Tibet, through Turkey. The name Kuvasz is not Hungarian either and is said to have derived from the Turkish word Kawasz, meaning armed guard of the nobility. There was a period of time when only people nobility in favor with the royal family were permitted to own a Kuvasz. The Kuvasz is an extremely old breed and in the later fifteenth century, it was held in the highest respect. The breeding of the Kuvasz was cautiously planned and recorded. They were a fixture of most large Hungarian estates, serving as both guard and hunting dogs. King Matthias I was a special patron of the breed and kept a large kennel to improve the quality of the dogs. In later centuries, the Kuvasz were slowly starting to be owned by commoners, who used them as livestock dogs. It was during this time period that the breed’s name was corrupted to its present spelling. Oddly enough, the present spelling of the breed translates as mongrel. 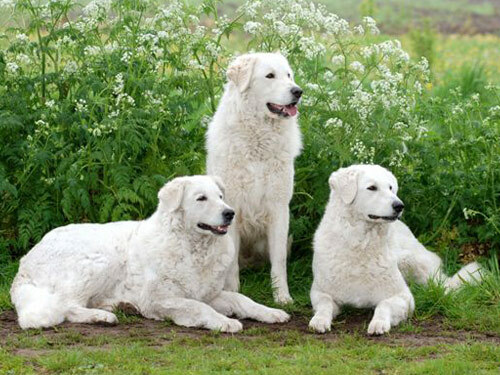 The plural form of the dog breed name Kuvasz is Kuvaszok. After the two World Wars, the breed drastically declined. However, luckily, German stock formed a basis for the breed to continue through these hard times. Some of the Kuvasz dogs had also been imported to America around the 1930s. After this, the Kuvasz breed received AKC recognition in 1935.